On 20 November, 1945 the Nuremberg trials began - the military tribunals called to prosecute Nazi war criminals closely involved in the Holocaust. Now, 71 years later, that work continues through the Bavarian State criminal office (LKA) in Munich, that has created a virtual reality version of the Auschwitz concentration camp to assist with the continued prosecutions. Digital imaging expert Ralf Breker is behind the project: "We spent five days in Auschwitz taking laser scans of the buildings and the whole project to complete took about six months." About 1.1 million people, mostly Jews, were killed at Auschwitz, most deceived into entering gas chambers where cyanide-based pesticide Zyklon B was released, killing those inside. Their bodies were then burned in the camp's many crematoria. Initially the model was created to be viewed on a computer monitor, but it has now been adapted so that once the viewer puts on a VR headset they can examine the camp from almost any angle. Towards the end of the war the SS destroyed most of the camp's files and records as well as the gas chambers and crematoria, leaving only one remaining, which at the time was used as an air raid shelter. In order for Ralf's model to be useful in court it had to be as accurate as possible. "We searched the Auschwitz archives and we were lucky, we found blueprints from all of the buildings that had been destroyed - so we were able to recreate them," he said. 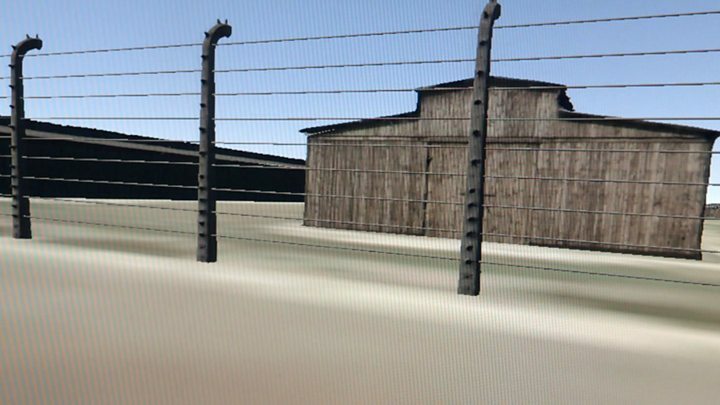 The VR version of Auschwitz is yet to be used in court, however, the 3D computer model was used in the most recent war crimes prosecution of wartime SS camp guard Reinhold Hanning. In June this year, Mr Hanning was sentenced by a German court to five years in jail for being an accessory to at least 170,000 murders. Mr Breker notes that the 3D model aided the prosecution. "In the court decision the judge explicitly referred to the model and said that the model made it possible to grasp what Reinhold Hanning would have seen from his post at the watch tower." While many senior members of the Nazi regime faced trial for their crimes, many of the junior SS officers or camp guards who also perpetrated crimes in the camps escaped justice. Germany's Central Office for the Investigation of National Socialist crimes was established after World War Two in the town of Ludwigsburg near Stuttgart. Today, its staff are still attempting to identify Nazis guilty of committing crimes in the camps. "We think that each part of the machine was important - even the lower rank SS guard has to take his share of responsibility," said Jens Rommel, the chief senior prosecutor who runs the office. "I have heard the question very often, is it really worth continuing now 70 years after the war? But I think it's still important for the German state to do so, because these crimes were organised by the state and I think it's a task for the legal bodies to prosecute those crimes." He thinks the 3D model of Auschwitz is useful in specific trial circumstances. "This model is a helpful tool and it's especially important when it comes to a specific line of defence, a defence strategy used in almost all cases," he said. "The defendant admits that he was in Auschwitz but generally he says that he didn't know anything about what was going on in Auschwitz. And here the 3D model can help to understand what the person involved could see from his position." Beyond its use in war crimes cases, Mr Breker thinks the criminal justice system will make more use of VR in the future. "I think that within five to 10 years, virtual reality will become a standard tool for police, not just in Germany but all over the world because it's a way to make scenes of crime accessible even years later." "We have been at crime scenes that are terrible, but Auschwitz is in a league of its own. We met the director of the Auschwitz archives and he told us a lot of details about the industrial scale of the killing and it took quite an emotional toll."